The bedroom has not made many changes since last time, but here is a picture with the bed made and a picture hung over the bed. 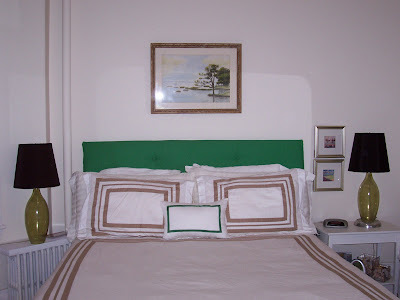 I had originally wanted to add light blue into the mix from the inspiration picture, BUT I just went over to Erin's blog Elements of Style and almost died when I saw another HOT Kelly green headboard!! This time with no blue, and I'm really loving it! I'm thinking I should nix the blue and spray paint the lamp bases white (because I'm still kinda liking the black shades). I know, I know- I am the queen of changing my mind. I was having a hard time finding the right blue that I wanted in there, so this is a much better option. It is a great photo to be inspired by! Have fun in your new room. I wish I was getting my projects done as quickly as you! 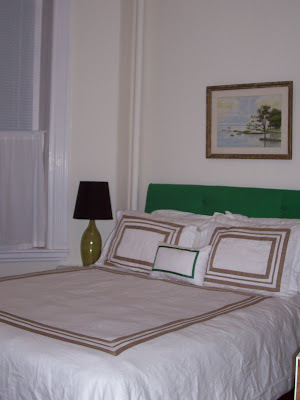 I love that green headboard. You are doing a great job. I saw where Lee's new home is featured in the Nov/Dec issue of Cottage Living. Can't wait to see it.